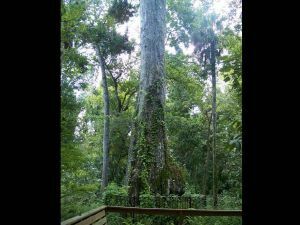 Lady Liberty, a 27.4 meter (90 foot) cypress tree located in Big Tree Park in Seminole County in Central Florida, will be used as a sample for officials who hope to clone the the 2,000 year old tree. The project is spearheaded by the Archangel Ancient Tree Archive, a non-profit organization known for seeking out and archiving samples of the world’s largest and oldest trees. Lady Liberty has a 3 meter (10 foot) diameter and a 9.7 meter (32 foot) circumference, and it is located in the same park as The Senator, which largely considered to be the sister tree of Lady Liberty. Sadly, the Senator, a 3,500 year old tree, was burned down in 2012 after Sara Barnes started a fire while smoking meth. A sad end to a remarkable tree. The Michigan based Archangel Ancient Tree Archive has already sent three representatives to scale Lady Liberty. While the tree is not necessarily under any immediate threat, the risks that landmark trees face (such as the fire that razed The Senator) is a constant reminder of how vulnerable they are. The organization is known for specializing in a cloning technique that coaxes tree tissues to develop its own roots. This process hopes to create living genetic libraries through horticultural propagation for reforestation and future research. The method has already been applied to 150 species with 90 percent of cloning projects resulting in trees that the organization has successfully replanted. Cimbers Andy Kittsley, Jim Clark and Jake Milarch notes that there were not a lot of new growth at the top of the tree, which could imply that Lady Liberty may not have a lot of years left, given the tree’s age, and current climate conditions.